EDMONTON — Kory Sheets eclipsed the 1,000-yard rushing mark, registering 139 yards and two touchdowns, as the Saskatchewan Roughriders outlasted a strong offensive performance from Mike Reilly and the Eskimos en-route to a 30-27 win on Saturday afternoon. Sheets became the fastest running back to reach the millennium mark in the process. Meanwhile, his quarterback Darian Durant entered today’s contest coming off a performance that saw him complete 18 of his 32 passes for 250 yards and two touchdowns, en-route to beating the Montreal Alouettes 24-21. Despite the solid numbers, Durant gave himself a failing grade, admitting that he knew he had plenty more to offer, as made evident from his play in Saskatchewan’s first six games of the season. In the early parts of today’s clash, Durant was solid, completing 7 of his 8 passes for 74 yards in the first quarter. But it was his counterpart Mike Reilly that entered the spotlight in the first half, picking up right where he left off last week against Toronto when he threw for 511 yards and three touchdowns in a losing effort. Reilly, who has been improving under centre with every passing week, led the Esks on a 7-play, 75-yard drive that culminated with the pivot firing a laser to slotback Fred Stamps for a 33-yard touchdown, giving the Esks a 10-6 lead. The score arrived after kickers Hugh O’Neill and Chris Milo exchanged three field goals, with the latter connecting on two to give the Riders the temporary lead. Two possessions later, Saskatchewan would cut Edmonton’s lead to just one, as Milo split the uprights for the third time of the game, this time connecting from 43 yards out. Milo would tack on another field goal with just under two minutes to go in the half to give the Riders a 12-10 advantage. With 40 seconds left in the first 30 minutes, Reilly earned a first down thanks to a pair of rushes for 7 and 14 yards, but gave away any momentum he would have gained when his pass intended for Cary Koch was intercepted by Tyron Brackenridge. Saskatchewan’s offence would down the ball on their ensuing possession, opting to enter the half with a two-point lead, rather than go for one last-ditch effort towards the endzone. The 12-10 score was a stark contrast to the 22-1 lead the Roughriders took into the half when the two teams last met in Week 1. In the first half, the Riders saw another solid performance by Sheets, with the shifty and brusing back rushing for 54 yards on 13 carries. On the other side of the ball, Reilly threw for 97 yards on eight completions, six of which found the hands of Stamps. The other two were strikes to Koch and Shamawd Chambers. After Milo booted through his fifth field goal of the game to extend Saskatchewan’s lead to five, Reilly and the Eskimos attack would answer in impressive fashion. Using a diverse attack that was effective both through the air and on the ground, Reilly marched his unit 75 yards downfield on nine plays, completing two passes each to Marcus Henry and Stamps, the last of which found Stamps for the receiver’s second TD of the game. 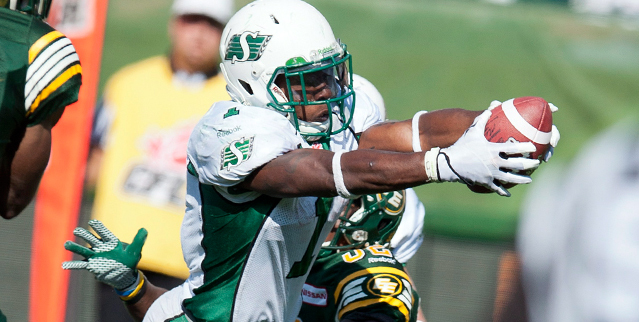 But Edmonton’s 17-15 lead was short-lived, as the Roughriders answered back with a major of their own in a hurry. After registering a season-low 74 yards and no touchdowns against Montreal last week, Kory Sheets exploded this week against the Eskimos, rushing for 139 yards and two touchdowns on 24 carries. On the very next possession, Durant hooked up with Taj Smith twice for a combined gain of 33 yards and also connected with Geroy Simon for an 11-yard chain-mover that pushed the veteran receiver above the 16,000-yard career receiving yards mark. From there, Sheets took matters into his own hands, rushing forward for consecutive gains of 18 and 10 yards, the second of which saw him find the endzone to give the Riders a 22-17 lead. On the run, Sheets eclipsed the 1,000-yard rushing mark. Whatever momentum the Riders gained from Sheets’ score was quickly erased, as the Eskimos, who were looking determined to earn their first home win of the season, put themselves in excellent position to do so. First, Reilly found Henry for a massive 51-yard gain and followed that up with two-straight passes to Koch, who trotted into the endzone untouched at the tail-end of the second grab. But the track meet was just getting started, as both teams were flexing their respective muscles on the offensive side of the ball in the fourth quarter. After O’Neill kicked his second field goal to give the Esks a five-point lead, Sheets took matters into his own hands, carrying the Riders offence with apparent ease. Following two-straight completions to Weston Dressler that brought the drive inside Edmonton’s 20-yard line, Sheets powered through the line for an 18-yard touchdown romp, reclaiming the lead for the Riders in the process. The back-and-forth action looked as though it would continue, but Saskatchewan’s defence came up with a clutch turnover with their backs against the wall, as Dwight Anderson picked off a Reilly pass in the endzone to end the threat of another possible lead change. Finally, with less than 1:30 to go in the game, the Riders defence came up big once again, as Weldon Brown and Craig Butler simultaneously sacked Reilly, who fumbled the ball. The Riders regained possession and used a few carries by Sheets to run out the clock for the victory. Next week, the Roughriders will host the Winnipeg Blue Bombers at home, while the Eskimos head to Calgary for the Labour Day Classic.